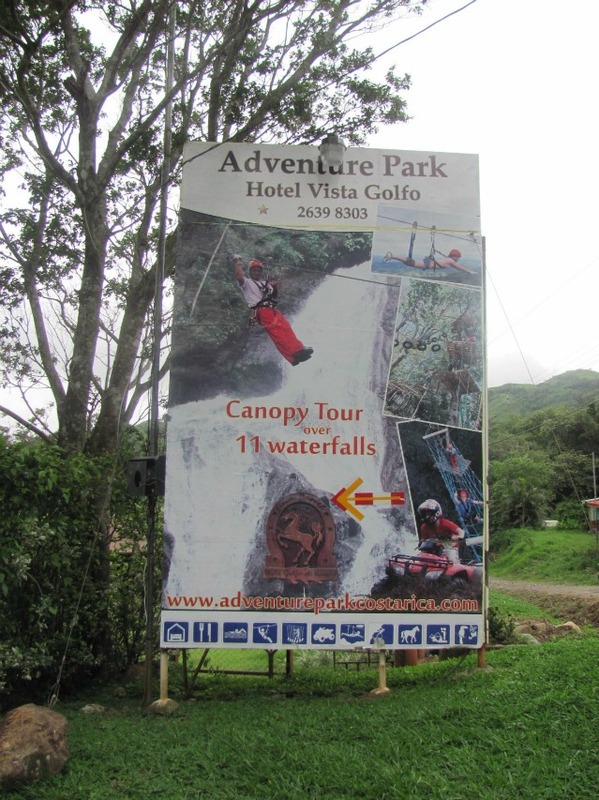 There are so many places and things to see and do when on vacation in the Central Valley of Costa Rica. Here we have made a list of our top attractions and our favorite things to see and do for both adults and children, while enjoying your vacation. 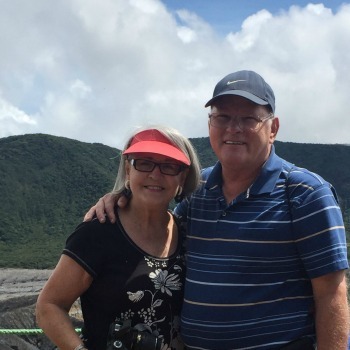 A trip to the closest active volcano is an excellent easy one day outing. The drive to the Poas Volcano National Park takes you on narrow roads that wind through a landscape of fertile coffee plantations, farms and dark forests. 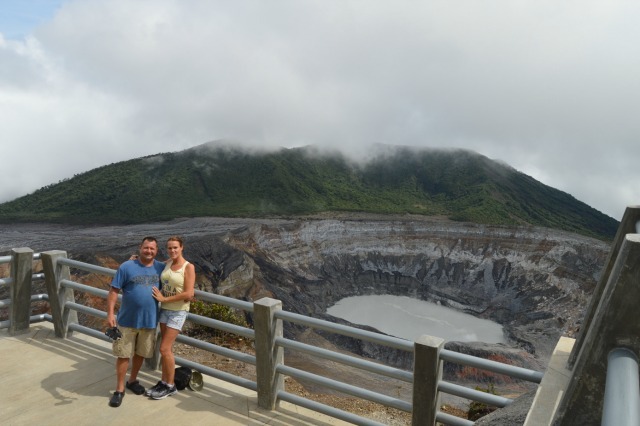 A visit to the Poas Volcano, which stands 8,885 ft. tall and is located within the Poas National Park, has a very nice information center. Overlooking the Crater Lake, the visitor’s center offers a spectacular view of the volcano. 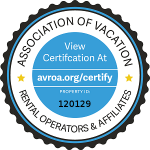 It is a site that should be a top priority for anyone traveling to Costa Rica. A paved road leads right to the top of the crater, although you will have to hike about a half mile to reach Poas’s crater. The crater is said to be the second largest in the world, and is more than a mile across. Geysers in the crater sometimes spew steam and muddy water almost 600 ft. into the air, making this the largest geyser in the world. Admission is $10. The Park is open daily 8:30 am – 3:30 pm. If you want to see the crater, it is best to arrive early in the morning. Be prepared for cooler temperatures, especially when the sun is not shining. The LaPaz Waterfall Gardens is also located on the way to the Poas National Park, but it may be best to visit this exciting site on the way back from the volcano. The original attraction here consists of a series of trails through primary and secondary lush tropical forests where there are several beautiful waterfalls alongside the La Paz River. In addition to an orchid garden and a hummingbird garden, there is a huge butterfly garden, birds, butterflies, monkeys, sloths, snakes, frogs and jaguars. 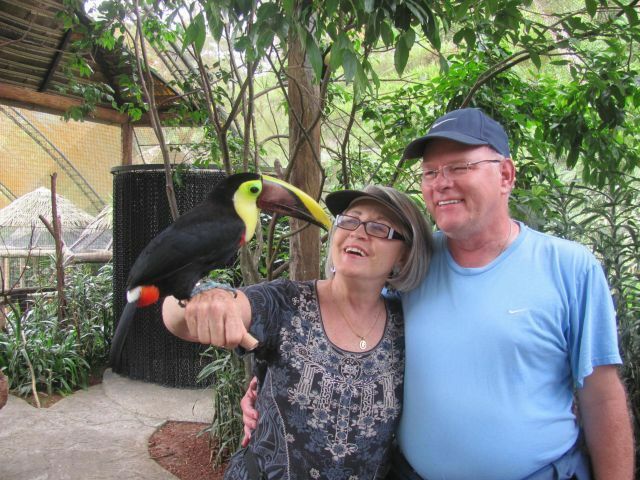 Our favorite here is the Bird Aviary because you can get photos of a many birds up close and even a Toucan perched on your arm. At La Paz Waterfall Gardens, you are guaranteed to see all that and more. Many guests say this has been their favorite attraction…and you can easily spend a whole day here because they have a large buffet with quite a varied menu to please just about everyone. Open daily 8 am – 5 pm. ZOO Ave.is located in the town of La Garita, Alajuela. 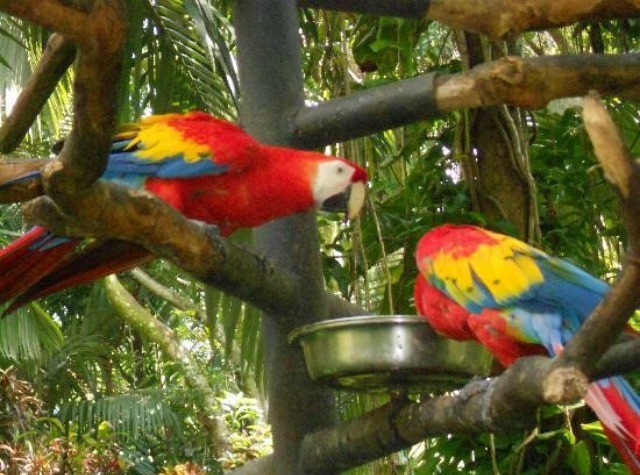 Dozens of scarlet macaws, reclusive owls, majestic raptors, several different species of toucans, and a host of other brilliantly colored birds from Costa Rica and around the world make this one exciting place to visit. There are other species on view that include iguanas, deer, tapir, ocelot, puma, and monkeys and a 12 foot crocodile! It takes about two hours to walk the paths and visit all the exhibits. Admission is $20 for nonresidents. Open daily 9am – 5 pm. 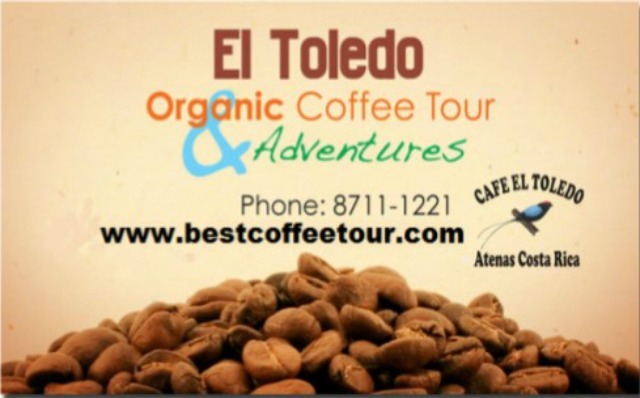 A guest spent an afternoon at the small El Toledo coffee plantation and says it is a must see attraction if you are staying in Atenas! The tour given by the owner’s son is real, unaffected, un-commercial, informative, and inspirational and gives you a great perspective on what organic farming is all about. For those who want to learn about organic farming this is a phenomenal tour. Depending on what time your tour is you will always enjoy samples of their coffee and you may also enjoy a lunch. Check their calendar for availability on dates and times. $15 per person for the 2 1/2 hour tour. Wear comfortable shoes! This large and long-standing coffee estate in Alajuela offers a tour that takes you from “seed to cup”. Along the way, you’ll get a full rundown of the processes involved in the growing, harvesting, curing, packing and brewing of their award winning coffee. Allow about 2 ½ hours. Call 506-2449-5152 for Reservations as they are required. Tours Mon – Friday 8:00 AM to 5:00 PM – Saturdays and Sundays until 4PM. Parque Valle del Sol is about a 30 minute drive east on Highway CR 27. (www.vallesol.com) 2282-9222. 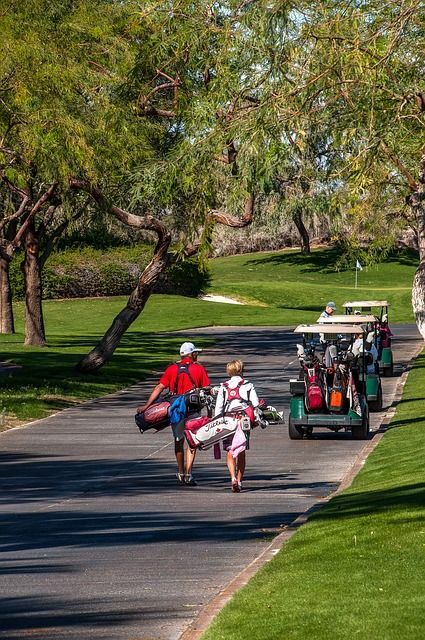 The 18-hole course here is open to the general public. Green fees are $67 per golfer per day, including one round of 18 holes and driving range balls playing both on the course and driving range. Reservations are essential. 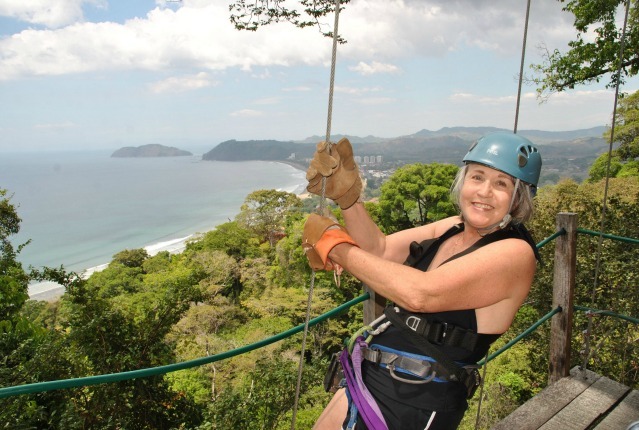 This zip-Line has 15 zip-line platforms with excellent views, and boasts the longest cable in the area, at almost a half mile in length. Admission is $60 per person. Reservations are essential. If a beach visit is on your “must do” list , the closest beaches on the Pacific side of Costa Rica are Playa Herradura, Playa Jaco and Playa Dona Ana. The easiest way to get to the beaches is to head west on CR 27. Then follow the signs to get you to several beaches that are off CR34 (Southern Coastal Highway.) From Atenas it will average about 45 minutes depending on the various beaches you want to visit. Week-end traffic is always busier. They also have an excellent 18 hole Golf course La Iguana (www.golflaiguana.com) that is open to non-guests. Green fees are $160 for a full round or if you tee off after noon the fee is $130. Club and shoe rentals are also available. Playa Jaco is definitely a surfer-dominated Pacific beach town that has a long stretch of beach that is natural volcanic sand strung with a dense hodgepodge of hotels, souvenir shops, seafood restaurants, and rowdy bars. Some of the larger hotels also have gaming casinos. 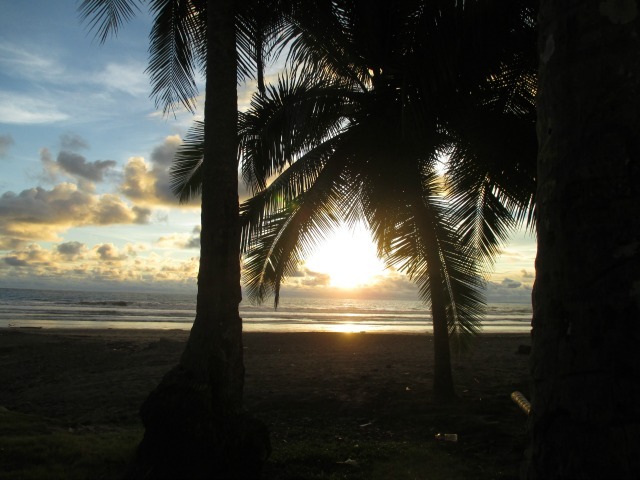 Check out this beautiful sunset on Playa Jaco beach I took one evening not long ago. Playa Dona Ana is located in North Puntarenas and could be an ideal destination to get away from the crowds. Playa Dona Ana is located a little over eight miles from the city of Puntarenas and around a mile from the port of Caldera. 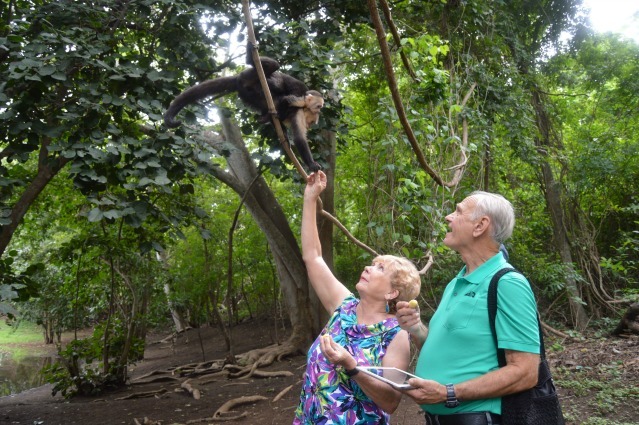 The beach is surrounded on each side of the bay by rocky cliffs with the opportunity to see Capuchin monkeys living in the wild. Be sure that you stop at one of the fruit stands along CR 27 and pick up some finger bananas to feed to the monkeys. Great photo opportunities abound. The water is warm and inviting but be careful of the currents. There are plenty of covered picnic tables close to the water and the volcanic sand is plenty warm so be sure to bring shoes. Playa Doña Ana now has nice off the road parking and now has its own restaurant and restroom facilities. Small entrance fee managed by the government. Take a look at the photo below showing some friends recently feeding a Momma and baby Capuchin at Play Dona Ana.